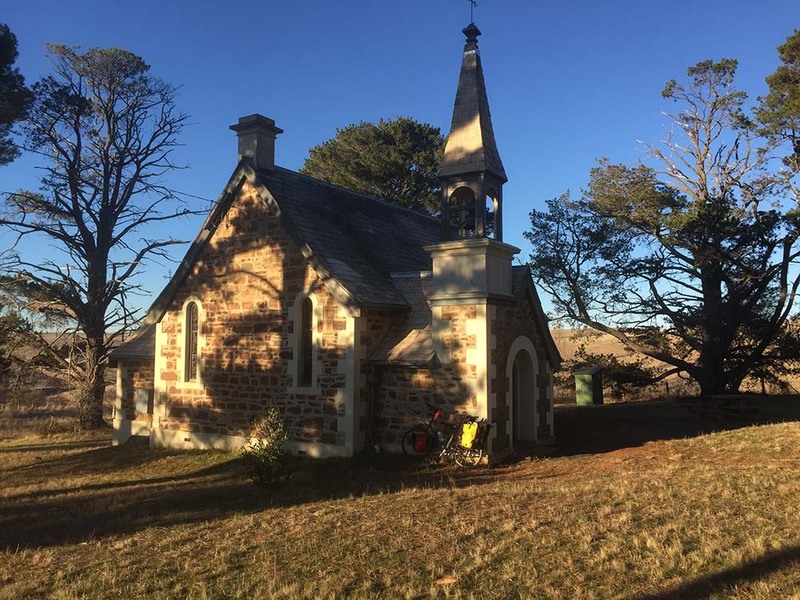 A few pics follow for a 7 day, 350km, mid-winter ramble from Jindabyne in the NSW Snowy Mountains to a friend's farm in the southern highlands near Tallong. 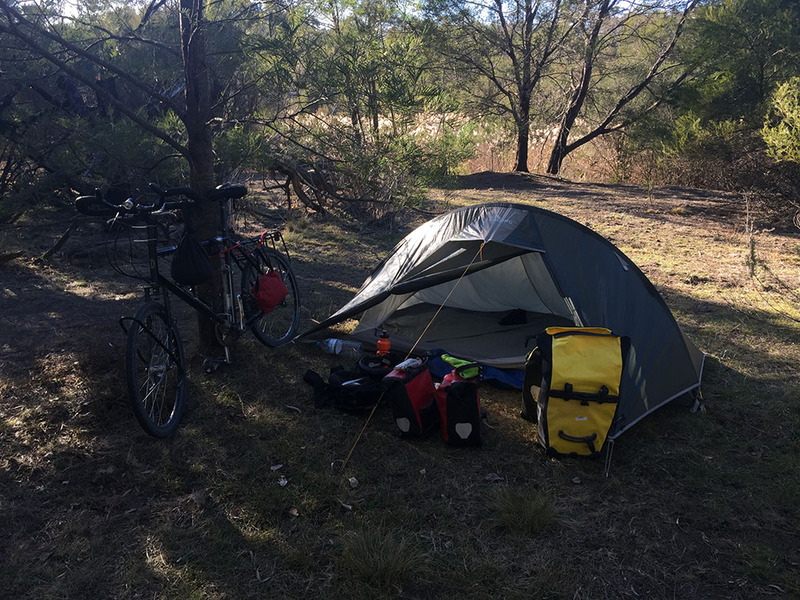 Temperatures ranged from about -6C (first night camping at Dalgety - ice in the water bottles stored inside the tent) to daytime max temps between around 11 and 13C for the week. I had planned around expected south westerly winds, which would have meant tailwinds the whole way (and colder), but of course north westerlies blew and my tailwind/headwind days where split 50/50, with one of the 'bad' days being a slog towards the town of Braidwood into a 30-40kph 'breeze'. Ugh. Above: All set, but leaving later than I should as the sun sets at 5:30pm this time of year. Only 35, hilly km for day 1 however. Above: A brief stop at the very pretty St James Church, Boloco (aka Beloka). Sun's getting low but it's mostly downhill to Dalgety from here and the wind's behind me. The manager at the Dalgety campground tells me it was -9 the night before. Yikes. 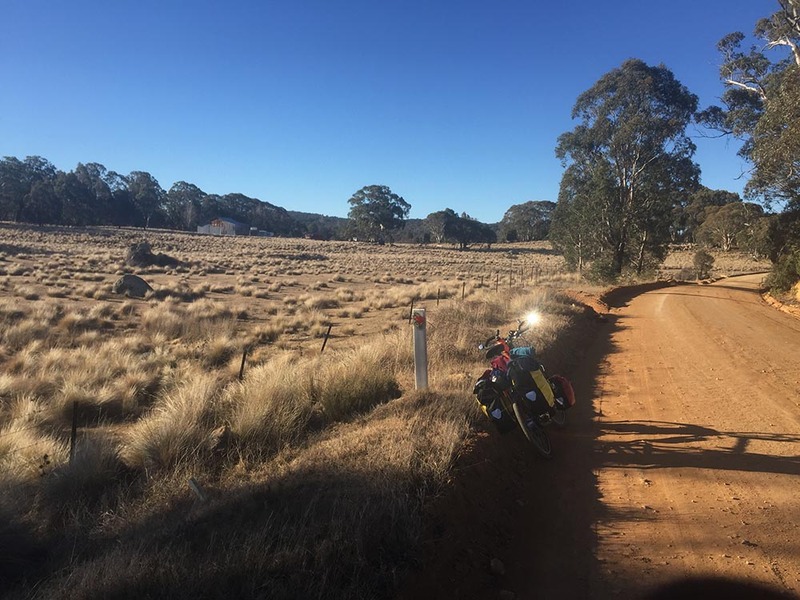 Above: Day 2 and I plough across the exposed Monaro Plains... straight into a murderous and freezing headwind. I'm knackered and elect to move my one rest day forward and take it in Cooma tomorrow, when 100kmh winds are predicted. Above: Day 4 is splendid - a brisk tailwind pushes me through the very pretty countryside to Numerella and up the ride's biggest climb (6 or 700ish vertical metres) towards the Deua National Park and Big Badja Swamp reserve where I camp wild. 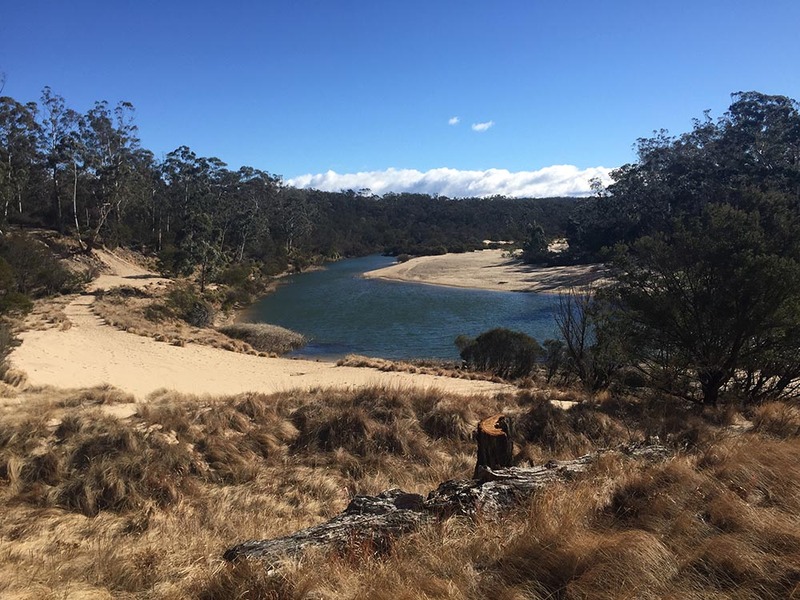 The scenery is gorgeous, especially higher up, around 1200m, where it's all alpine vegetation with tussock grasses and Black Sallee gums. Dirt road is is both freshly graded and compacted and as fast as sealed road, or it would be, but for the fact it's all uphill today. Above: Day 5 and soon after decamping I reach Pikes Saddle, the high point of the ride. 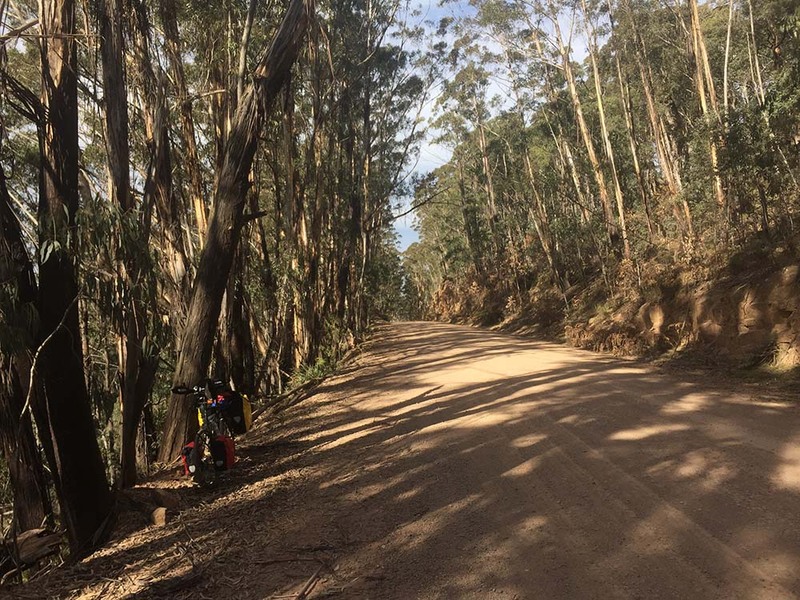 The next 70km to Braidwood is predominantly downhill. 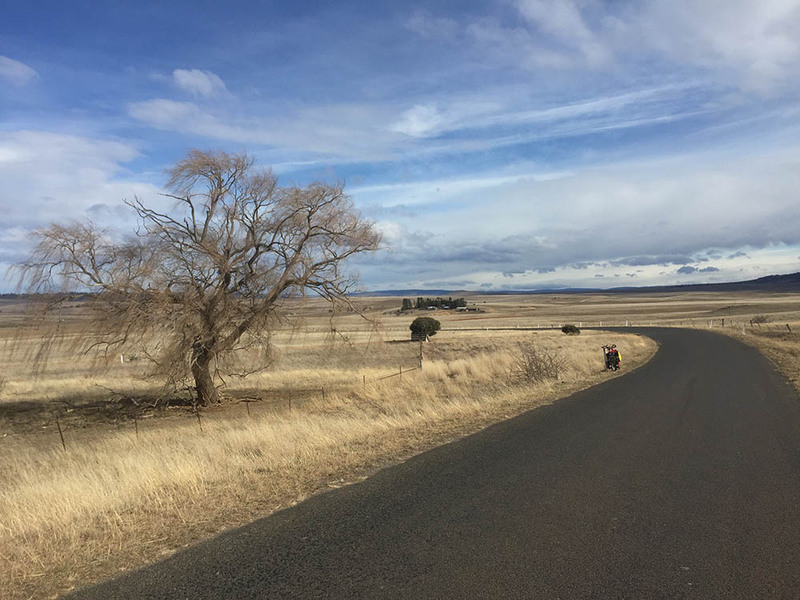 However, the headwind makes it seem anything but and it's a daylong slog, inching forward until about 10km outside Braidwood (and after sunset) I'm intercepted by my ute driving warmshowers host. Above: Day 6. The wind has shifted a bit this morning and I fly along for 24km with a tailwind until turning west to a shallow ford over the Shoalhaven river. This shot is from a lovely free campsite at the ford. I'll hazzard a guess it's crowded in the summer school holidays. Just look at those sandy beaches! the final 3rd of the day once again has me pushed along by the wind and I wild camp in a small unfenced nature reserve at an intersection. Above: Day 7. Campsite in the morning. Above: Day 7. And no ride in Australia is complete without at least one 'big thing'. 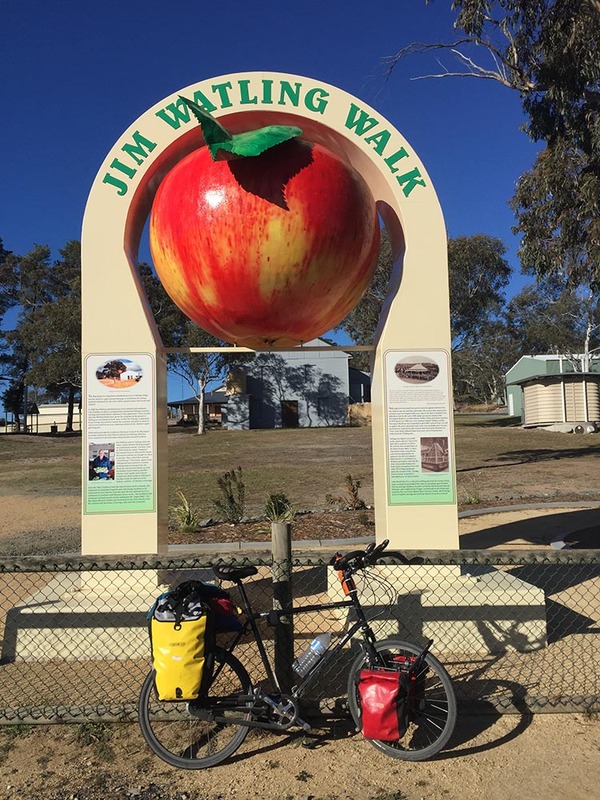 This one is 'The Big Apple' at Tallong. The ride ends about 20km from this, um, stunning landmark. What a great country we live in but those winds can be very character building! Love your tour, especially the graded and compacted dirt roads. That's God's own countryside! And there's an awful lot of it. 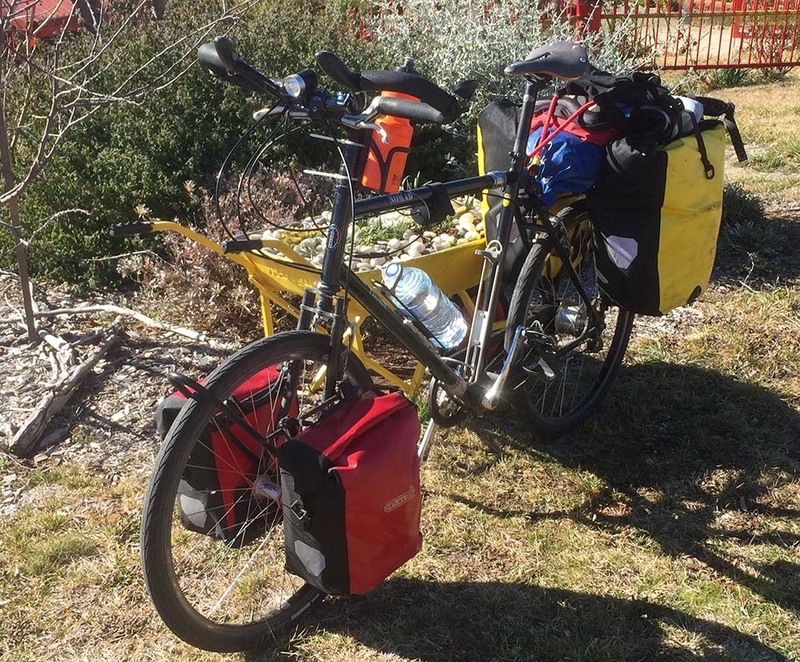 For those living Up Above, a "ute" is not a short relative of mine, but a utility automobile, basically a car with only two seats and the rest of it a load carrying platform, suitable for carrying a loaded touring bike or two. For John Saxby and Mike Ayling and any others with Southern African experience, it's a "bakkie". Americans should not relate it to an F150 but to an El Camino, and adjust to Falcon-sized rather than full-sized. Great photos, and I can imagine those cold winds in the hill country. Title for a Southern Hemisphere photo-essay, Andre: "Utes, Bakkies, and Bogans". any takers?